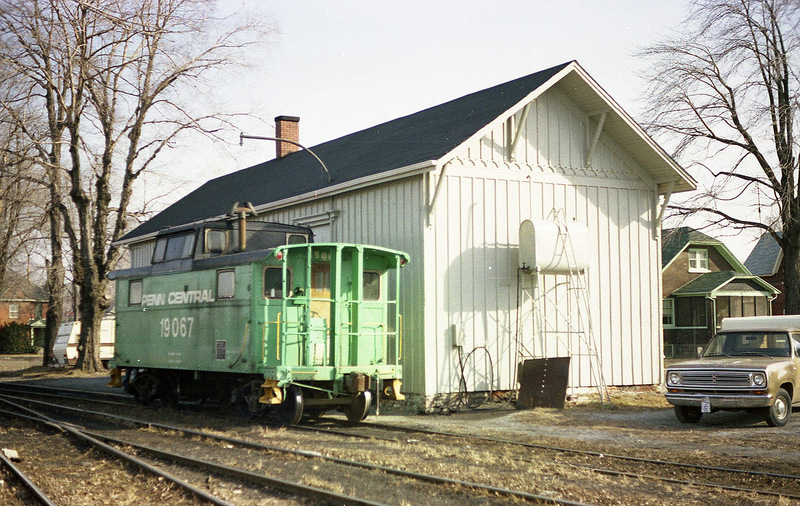 Railpictures.ca - A.W.Mooney Photo: Began life as Pere Marquette station, the line ended as CN Leamingston Spur (out of Comber) and then the line was taken up. The station lives on, a heritage building seen just off Talbot St in the city. The old spur is now what else? A walking trail. By the time I got to shooting anything that was once Penn Central, almost all the vans were painted into Conrail. For me this was a lucky catch, even though I had to go back another time for a better shot of the station. | Railpictures.ca – Canadian Railway Photography – photographie ferroviaire Canadienne. Caption: Began life as Pere Marquette station, the line ended as CN Leamingston Spur (out of Comber) and then the line was taken up. The station lives on, a heritage building seen just off Talbot St in the city. The old spur is now what else? A walking trail. By the time I got to shooting anything that was once Penn Central, almost all the vans were painted into Conrail. For me this was a lucky catch, even though I had to go back another time for a better shot of the station. And is it merely coincidence that the green paint matches the soffits/fascia of that home in the background ..?? Frig, and now this is in the Time Machine. Arnold, you just keep racking up the hardware on this site eh? At one time the line did go down to the lake at a location known as “Seacliffe”. The location approximately where the Pelee Island ferry is today. Mike McIlwaine was the L&StC expert. He worked as freight agent at Leamington during the 80′s with CR. Sadly Mike passed away a couple of years ago. RTC: Did this Leamington & St. Clair ever extend down to the waterfront? It would make sense but I know nothing of it. OOPS!! CTP rather than CTG: slip of the fingers here, I suppose, although we both know it was a brain-flub. Three guys to thank here: CTG and “nutbar”:o) appreciate kind words and will try and post a few more images in 2017…………RTC Dave: I was wondering about this Spur Station; I thought PM originally built this off downtown and the Comber stretch was added later; but no, that wasn’t the case. The C&O(PM) downtown I believe caught fire about 25 years back. Know anything on this? Arnold. I don’t think this was ever a PM station. The C&O (PM) depot was closer to downtown. This line was originally built as the Leamington & St Clair Railway. Ended up as Michigan Central then NYC, PC, CR, CN. 1977 would make this the CR era. The Canada Division didn’t rush to paint everything blue. That trailer belonged to one of the crew, was always there. THat’s something I wouldn’t have expected to see in Ontario. Another good “Historic Mooney” shot.